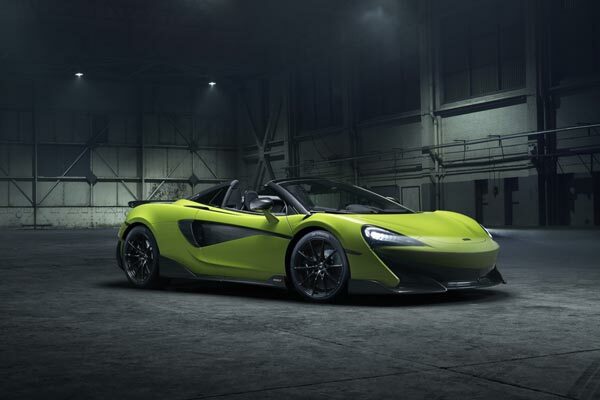 McLaren Automotive has released the first images and details of the third new model in its approximately BD581 million ($1.542 billion) Track25 business plan - the McLaren 600LT Spider. The fifth car to carry the Longtail name, the new convertible fully embodies the McLaren Longtail philosophy of increased power, reduced weight, optimised aerodynamics, track-focused dynamics and limited availability, said a company statement. “Taking full advantage of the strength of the carbon fibre MonoCell II chassis has ensured that the new Spider has dynamic abilities and performance on par with the 600LT Coupé, for a weight premium of just 50 kg and with no additional structural strengthening required,” he said. “In addition to our weight advantage over competitors, we have also retained the top-exit exhausts that debuted on the Coupé – and I’m pleased to report that they sound and look even better with the roof or rear window of the Spider lowered,” he added. Like its 600LT Coupé sibling, the Spider records a significant weight saving over the model on which it is based, with McLaren’s engineers achieving a reduction of 100 kg* at DIN weight over the 570S Spider. The result is a weight penalty of only 50 kg over the Coupé, which contributes to a lightest dry weight of just 1,297 kg for the Spider. This is at least 80 kg less than any direct competitor and the equivalent power-to-weight ratio of 463PS-per-tonne underpins astonishing levels of performance and dynamic prowess. Enhancing the Sports Series Longtail experience with open-air motoring is as easy as pushing a button to lower or raise the three-piece, powered retractable hardtop roof at speeds of up to 40km/h (25mph). With the roof lowered, occupants benefit not only from wind in their hair, but also the memorable aural and visual drama provided by the top-exit exhausts that are unique to the 600LT. An electrically-operated, glazed wind deflector can be activated independently of the hardtop, to reduce buffeting or increase ventilation – or simply to allow more of the exhaust sound into the cabin. Equally importantly, it allowed McLaren’s design team to maintain the focused design language and silhouette of the 600LT Coupé. The uprated powertrain enables the driver to exploit the 600LT Spider’s carbon fibre monocoque chassis to the full, aided by a dual-clutch, Seamless Shift seven-speed Gearbox (SSG) that features Ignition Cut in Sport mode to facilitate faster changes whilst delivering a dramatic aural crack from the top-exit exhausts, plus Inertia Push in Track mode to optimise acceleration. The 600LT Spider will reach 100km/h (62mph) from a standstill in 2.9 seconds, with 200km/h (124mph) achieved in just 8.4 seconds – a near-indistinguishable 0.2 seconds slower than the Coupé. The maximum speed is 324km/h (201mph) with the roof raised, or 315km/h (196mph) with it lowered. Lowering the roof of the 600LT Spider showcases the performance-orientated interior, which features lightweight Alcantara trim and Carbon Fibre Racing Seats from the McLaren P1 as standard. The Super-Lightweight Carbon Fibre Racing Seats designed for the McLaren Senna are available as an option, either on their own or within the MSO Clubsport Pack. Further weight-saving options and measures – including deletion of the audio and climate control systems – are available to buyers determined to shave off every kilogramme possible.